Mahinda P.Liyanage Galle Central Special Corr. Sri Lankan javelin thrower with global fame Nadeeka Lakmali Liyanage was presented with a house worth Rs. 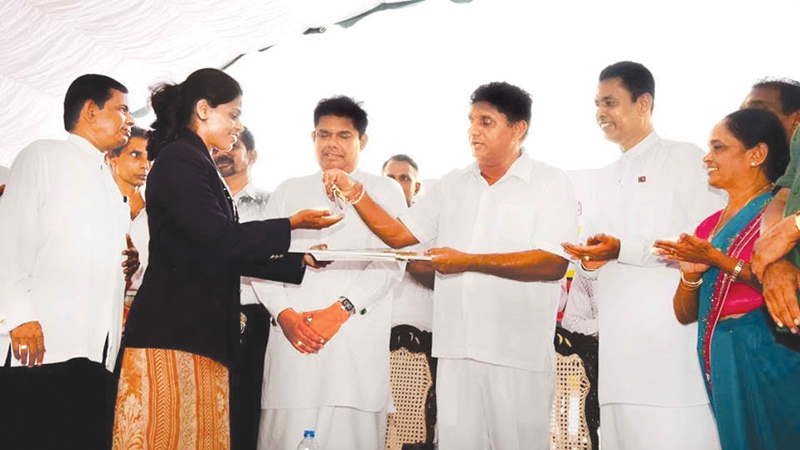 4.2 million at “Suramayagama” launched under the revived Village Awakening Model Village program at Mahakurunda, Miriswatte in Bentota, Galle by Housing and Construction Minister Sajith Premadasa. Minister Premadasa made the presentation at a request made by Lands and Parliamentary Affairs Minister Gayantha Karunathilake. Lakmali, born in Elpitiya, Galle, Lakmali represented Sri Lanka at the 2008 Summer Olympics in Beijing, where she competed in the women’s javelin throw. She also qualified for the IAAF World Championships in Moscow in August. She is the second athlete from Sri Lanka after sprinter Susanthika Jayasinghe to reach the final round at an IAAF World Athletics Championships.